Casse and I got a chance to photograph in New England this fall. Although planning and implementation didn’t flow seamlessly with the late onset of color there this year, we managed to finagle last minute schedule changes with airlines, hotels and work. We arrived toward the tail end of the fall color season in the northern reaches of New England, but as usual, we played the hand we were dealt. 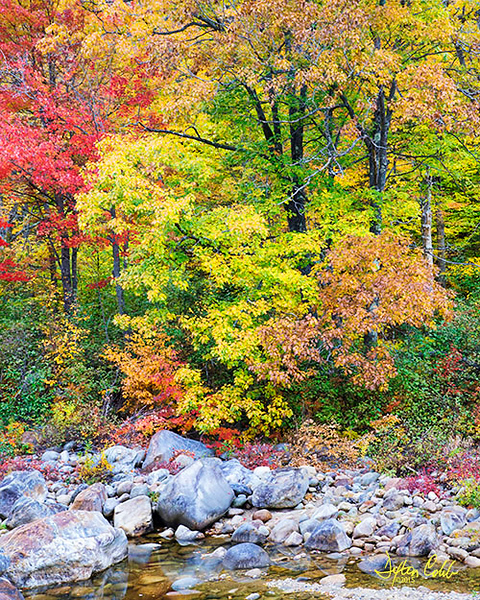 The season was curtailed further by a cold snap which forced us to flee south for vibrant color after about a week. We camped out in Gorham, New Hampshire initially, finding it rather centrally located for both northern and southern interest. The strongest images from the trip were made in Maine. We found New Hampshire mostly past peak for the areas we planned to shoot, and did not make it to Vermont until after the cold snap ended the show there. The present image was found on the Wild River, a jewel among the many brown trees surrounding it. The boulder’s reflecting in the water add a nice touch here. This was a very peaceful and quiet scene with the waters barely moving or still, no wind, and no one there but us. For me, this peaceful serenity is palpable.